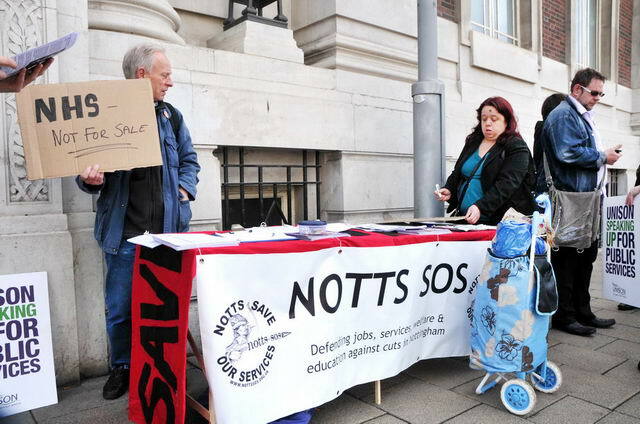 ← Nottingham anti-cuts diary dates in May and June 2011 – more being added so keep looking for updates! 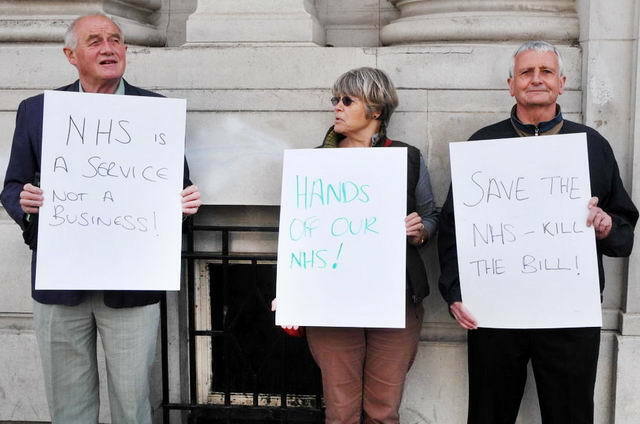 About 20 of Notts SOS turned out on 18th May to picket the NHS ‘Listening Exercise’ held at the Belgrave Rooms in the city. Placards and notices saying Kill the Bill, Bin the Bill, Hands Off Our NHS, Sickness is Not a Profit Making Industry, made our point clear. Many people arriving for the event stopped to look at our stall, pick up information and our newsletter and talk, and passing vehicles hooted their support. Our new printed waterproof banner with our name and logo on was ready for the event, and tied to the front of the stall. Some of us then went inside to join the exercise when it began at 6pm, but a presence was kept outside throughout and interested members of the public continued to stop and ask what it was all about. The listening exercise was run jointly by Nottingham City and Nottingham County PCTs (Primary Care Trusts). Present were PCT staff, and Vicky Bailey who is a member of the government’s NHS Future Forum and chief officer of an existing GP consortium (Principia). The chair of the Future Forum, Prof. Steve Field, said earlier this week that the proposed NHS reforms were unworkable. The Nottingham meeting was overwhelmingly opposed to competition in the NHS and the use of private contractors. But the impression gained by the audience of about a hundred, was that the exercise was only concerned with making cosmetic changes to the underlying plan, and leaving the marketisation of the NHS untouched. Those present who left their names and addresses were promised that they would be sent a copy of the summary of opinion that will be forwarded to the Future Forum. No-one who attended could be left in any doubt that the public are overwhelmingly opposed to this government plan. Bassettlaw and Notts SOS supporters also attended the listening event in Edwinstowe on the previous day and here is a report. There was a protest outside organised by the Bassetlaw group and gave out leaflet: SAVE OUR NHS FROM LANSLEY wearing their Robin Hood hats with ‘Robin Hood says Keep our NHS public’ and ‘Robin Hood says the NHS belongs to the people not big business’. About 100 people attended the listening event, mainly older people. There was considerable opposition to the Bill proposals particularly to the privatisation of the NHS. It was quite heated and people were keen to ask questions from the floor. The meeting was fronted by Zoe, the PCT Public Involvement Manager who was asked difficult questions and took the flack – apparently no one from the Future Forum had been able to attend. There was a presentation on what’s happening (with much interupting by questions) and then group work (based on the 4 topics in the Listening exercise) and feedback to the whole group. Responses will be collated and fed into the DH. There were no GPs or MPs present, as far as this reporter was aware. It was round table stuff – but every table reporting back made it quite clear privatisation was not an option and the reorganisation should be shelved. Note: Bassetlaw is not part of NHS County – it is joining up with Doncaster and Rotherham. Forthcoming event: Saturday 21th May. Visit (and/or help with) Notts SOS health campaigning stall from 12-2pm in Market Square, Nottingham. There also will be an opportunity to sign a ‘Keep the NHS public’ petition. If you would like to get more involved with Notts SOS and Save the NHS activities, do get in touch via our usual address (see https://nottssos.org.uk/contact/ ). You can be added to our announcements list. Alternatively consult the diary dates on this website and or subscribe to receive messages when they are posted to the website (fill in form on the right of the home page). This entry was posted in Road to success, What cuts and tagged city, demonstration, health. Bookmark the permalink.